The Licensing Unit regulates security guards, security agencies, private investigators and private investigative agencies. Additionally, the unit accepts complaints from the public and enforces statutory laws and administrative rules pertaining to those entities. The office is closed on weekends and all state holidays. The identification card issued by the Licensing Unit displays a hologram, a digitized facial photograph and information about the applicant. 1. Fill out the Card Replacement Request form. 2. Submit $10 cash, cashier's check or money order payable to DPS. 3. Provide proof of identification, such as a photocopy of your Drivers License. 4. If you have had a name change, provide photocopy of the legal documentation. Please mail the completed card replacement request form and any supporting materials to our mailing address or bring all materials to the Licensing Unit. Most requests can be fulfilled while you wait. Security Guards and Private Investigators must submit a letter to the licensing unit within 15 calendar days of any change in residence or mailing address, per ARS §32-2624.D and AAC 13-2-305. The change of address letter must show your name, guard registration number(s), phone number(s), previous address and new address. Security Guard and Private Investigation Agencies must notify the Licensing Unit by letter within 30 calendar days regarding changes to the agency's mailing and/or physical address, per ARS §32-2614.D. 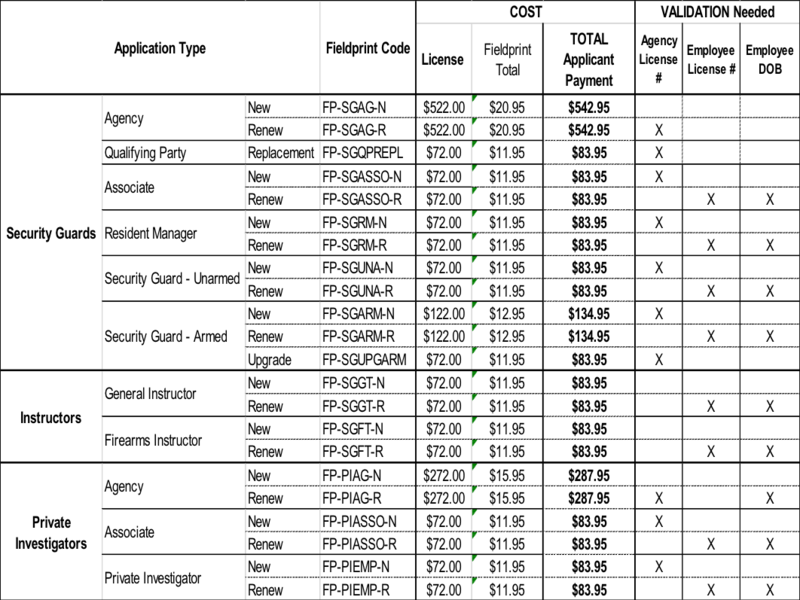 and ARS §32-2425.D. The letter must be on company letterhead and signed by the qualifying party (or the security guard agency's resident manager). The letter may be sent to our mailing address or hand delivered to our office. Security Guard and Private Investigation Agencies must notify the Licensing Unit by letter within 15 calendar days regarding changes to the branch office mailing and/or physical address, per AAC 13-2-205.E. and AAC 13-6-204.E. The letter must be on company letterhead and signed by the qualifying party (or the security guard agency's resident manager). Where is the Licensing Unit located? The Security Guard/Private Investigator Licensing Unit is located in the DPS Public Services Center located at 2222 W. Encanto Blvd. in Phoenix, AZ 85009. The Security Guard/Private Investigator Licensing Unit is located in the DPS Public Services Center located at 2222 W. Encanto Blvd. in Phoenix, AZ 85009. How do I apply for a license or registration? • You can obtain the application packet from your employer or agency. • You can also download an application from our website, https://www.azdps.gov/services/public/licensing, however it is not a complete packet as it does not include a fingerprint card. • To obtain a paper application packet by mail, call the Licensing Unit at (602) 223-2361 and request one be mailed to you. • To apply electronically, click the Apply Online tab. • This option is available to Arizona residents only. • Applying electronically could significantly reduce processing times when no research is required when compared to submitting a paper application. • When applying electronically, you will be able to schedule your electronic fingerprinting appointment. No hard copy fingerprint cards will be needed. NOTE: If your application does not require a fingerprint, you are not eligible to apply online. Can I go to DPS to be fingerprinted for a Security Guard or Private Investigator License/Registration? DPS does not provide fingerprinting for the public for this purpose. For fingerprinting services, it is recommended you contact your local police department or a professional fingerprinting service. 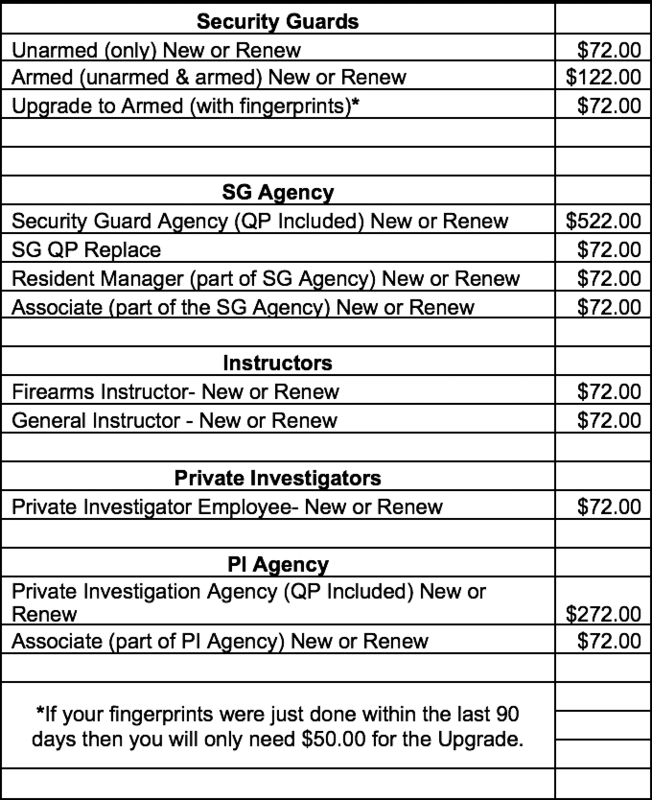 What is the fee to apply for a Security Guard or Private Investigator License/Registration, and what forms of payment are accepted? The DPS fee is used to process the application regardless of the final result, approval or denial of a security guard or private investigator license or registration. The DPS fee is subject to change at any time, and is non-refundable pursuant to AAC R13-2-102(C) and AAC R13-6-103(D). • DPS can only accept the following forms of payment, made payable to the Arizona Department of Public Safety: cashier’s check, money order, check drawn on a business account or cash in the exact amount. 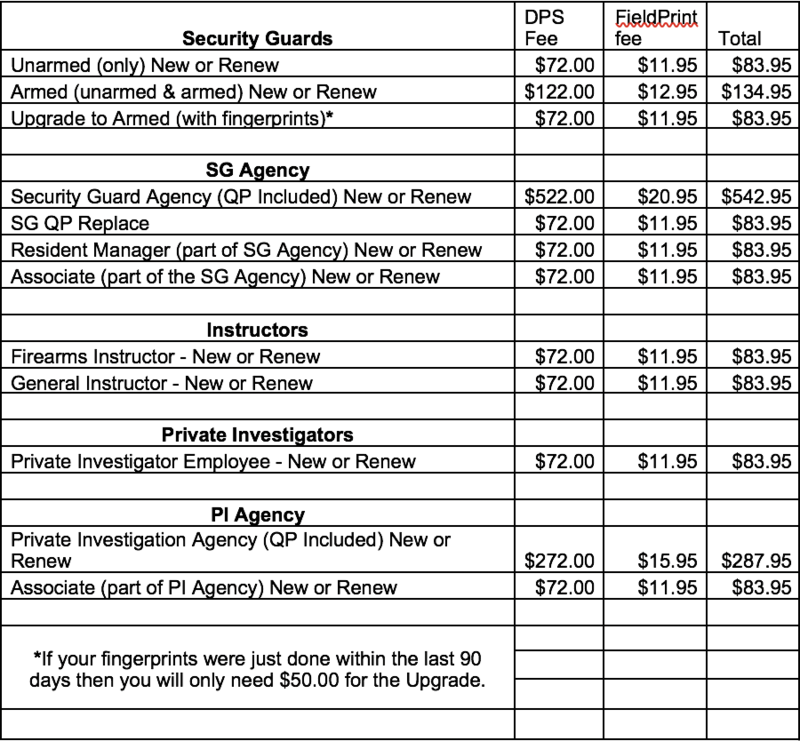 • Depending where you have your fingerprints taken and your training done, there may be an additional fee for the service, which is not controlled by DPS. • There is an additional vendor convenience fee, which includes your photo and fingerprinting being done at an approved vendor location. • The electronic application processing fee may be paid on-line when you apply with either a credit or debit card. For applicants with no criminal history record, the processing time is currently less than ten days. Please note, this average is subject to change at any time (can increase or decrease) depending upon the number of applications received by DPS. For applicants with a criminal history record which will require research by the applicant, the processing time can vary. The applicant will be given 45 days to produce to requested documents, once the requested documents are received and verified the application can be approved or denied within 5 business days. Please note, this average is subject to change at any time (can increase or decrease) depending upon the number of applications received by DPS. This is a new process so we have no timeframes but it will reduce the timeframes from the above paper process. Your fingerprints will be used to check the criminal history records of the state of Arizona and of the FBI. DPS and the FBI may retain your fingerprints and associated information after the completion of this application and, while retained, your fingerprints may continue to be compared against other fingerprints, including latent fingerprints submitted to or retained by DPS and the FBI. If you have a criminal history record, the officials making the determination of your suitability for the job, license, or other benefit must provide you the opportunity to complete or challenge the accuracy of the information in the record. You should be afforded a reasonable amount of time to correct or complete the record (or decline to do so) before officials deny you the job, license, or other benefit based on information in the criminal history record. The procedures for obtaining a change, correction, or updating of your FBI criminal history record are set forth in Title 28, Code of Federal Regulations (CFR) Sections 16.30 through 16.34. Information on how to review and challenge your FBI criminal history record can be found at www.fbi.gov, under Criminal History Summary Checks, or by calling (304) 625-5590. To obtain a copy of your Arizona criminal history record to review, update or correct, you can contact the Arizona Department of Public Safety Criminal History Records Unit at (602) 223-2222 or obtain a Review and/or Challenge packet here. Can DPS tell me if I qualify for a Security Guard or Private Investigator License or registration before I apply? DPS cannot pre-screen an applicant. DPS cannot determine if an applicant is eligible for a security guard or private investigator license or registration until the fingerprint-based state and federal background results are received and reviewed. Where can I find out what offenses could keep me from obtaining a security guard or private investigator license or registration? • Precluding offenses for a security guard agency license can be found in A.R.S. 32-2612. • Precluding offenses for a private investigation agency license can be found in A.R.S. 32-2421. • Precluding offenses for security guard registrations can be found in A.R.S. 32-2622. • Precluding offenses for private investigator employee registrations can be found in A.R.S. 32-2441. • Precluding offenses for a security guard firearms and general instructors can be found in A.R.S. 32-2625. Can you send me and/or my employer an email or fax saying my application is in process or that my card is valid? DPS cannot send an email or fax to an employer regarding the status of an application, or to verify a license or registration is valid. The employer will need to use one of the options noted under the FAQ “HOW AND WHEN CAN I CHECK THE STATUS OF AN APPLICATION?” or “HOW CAN I CHECK TO SEE IF A LICENSE OR REGISTRATION IS VALID?”. How and when can I check the status of an application? • You can check the status of an electronic or paper application on-line at the Arizona Department of Public Safety’s License Status tab. • You can also check the status by calling (602) 223-2361. Based on the number of callers ahead of you, you may experience a wait time. • The status of a paper application will not be available on-line, or if you call, until it has been entered into the DPS database. How long before it is entered will vary daily, based on mail transport time and the volume of applications received by DPS. No specific time frame can be provided. • For electronic applications allow approximately 24 to 48 hours (could possibly take longer) after you have been fingerprinted for the status to be available online. How can I check to see if a Security Guard or Private Investigator License/Registration is valid? 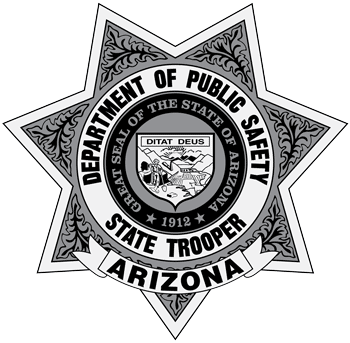 • You can check the status of a security guard or private investigation license or registration on-line at the Arizona Department of Public Safety’s License Status tab. After I apply, if my mailing address changes, should I notify DPS? Per A.R.S. §§32-2424(D), 32-2614(D), and 32-2624(D). The only way DPS will know if your address changes is if you contact DPS directly. It is imperative you contact DPS with your current address to ensure you receive any correspondence concerning your application. As an employer, if a person provides a photocopy of a security guard or private investigator registration, or the actual card itself, is that proof that it is a valid card? A photocopy of a security guard or private investigator registration or the Card itself is not proof it is a valid card. As an employer, you will need to either check the status on-line or contact DPS (see FAQ “HOW CAN I CHECK TO SEE IF A SECURITY GUARD OR PRIVATE INVESTIGATOR REGISTRATION IS VALID?”) to determine if the person has a valid card. If the person only provides a photocopy they should request a replacement of security guard or private investigator registration. (See FAQ “HOW MAY I OBTAIN A REPLACEMENT OF MY SECURITY GUARD OR PRIVATE INVESTIGATOR REGISTRATION IF IT IS LOST, STOLEN OR MY NAME CHANGES?”). How may I obtain a replacement of my Security Guard or Private Investigator Registration if it is lost, stolen or my name changes? • On-line– Print the form found on the Card Replacement tab . The completed form must then be mailed to DPS with the required $10.00 in the form of a cashier’s check, money order, cash in the exact amount. • In Person - You can come down to our office and request the replacement in person by filling out the card replacement form and paying the $10.00 fee. How long is a Security Guard or Private Investigator Registration/License valid for? A security guard or private investigation registration or license is valid for two (2) years. How long before my card expires should I send in a renewal application? DPS recommends renewal applications be submitted approximately 60 days prior to the current card expiration. This will allow for adequate processing time, as well as any issues or concerns that may arise in the process. If I lost or never received my denial or suspension letter, can I get a copy? Yes. Call (602) 223-2361 and ask for a copy of the letter, or email the Licensing Unit at [email protected] (be sure to provide your full name, application number, and date of birth). A copy of the letter will be mailed to you via US Mail. Due to the confidential criminal history information contained in the letter, it cannot be faxed or sent via email. Pursuant to A.R.S. § 38-431.02, the Private Investigator and Security Guard Hearing Board hereby states that all notices of the meetings of the Private Investigator and Security Guard Hearing Board and any of its committees and subcommittees will be posted in the south entrance lobby of the Department of Public Safety Headquarters Building, 2102 W. Encanto Boulevard, Phoenix, AZ. The notice is also posted at 1700 W. Washington Street, Phoenix, AZ on the computer kiosk located in the lobby. These locations are open to the public Monday through Friday from 8:00 a.m. to 5:00 pm except legal holidays and state mandated furlough days. Additionally the notice is also posted to this website by the Department of Public Safety Licensing Unit. Such notices will indicate the date, time and place of the meeting and will include an agenda or information concerning the manner in which the public may obtain an agenda for the meeting. Hearing Board Agendas will be located here. Agendas will be posted approximately one week prior to the hearing date and no less than 24 hours before the hearing date. Hearing dates are subject to change since the AZ POST has priority over the Boardroom. Should a hearing date change, the Licensing Unit will give as much notice as possible to all board members. The office is closed on all state holidays. 4. Click “I know my Fieldprint Code” and type in Fieldprint code for your application type. a. DO NOT USE THE DROP-DOWN MENU – this is for Fingerprint Clearance Cards only. Accidentally using the drop-down menu will NOT result in a Security Guard/Private Investigator Registration/License. FEES WILL NOT BE REFUNDED. a. A notification that the application has been received listing the additional documents needed will be delivered to your email from DPS. 11. Deliver additional documents to DPS Licensing. a. Your application will not be processed until these items are received. b. Please make sure that your FIRST and LAST name and DOB are clearly written on the documents so they can be matched up to your application. c. Can be mailed, delivered, emailed or faxed. Cannot respond to the email you receive.